NBC10's Harry Hairston and BTB Security's Matt Barnett discuss the escalating number of Robo Calls hitting the Philadelphia area. It's not who's calling, it's what's calling. Robo calls are on the rise and BTB Security's Matt Barnett talks about how to avoid these nuisance calls now and best practices moving forward. BTB Security's Matt Barnett discusses with NBC10 in Philadelphia how seemingly simple social media settings and quizzes can allow the disclosure of personal information. BTB Security shows NBC10's Drew Smith the importance of understanding the vast amount of information that exists about individuals, without them even knowing it. What's more important, how easily it can be accessed. Chief Information Security Advisor Matt Wilson discusses the conspiracy theories around Apple's planned obsolescence with their iPhone products. Ron Schlecht's Keynote Address, "Real Talk Security" at the Borgata in Atlantic City, NJ. BTB Security's Matt Barnett discusses the Equifax Breach size & scope. BTB Security's Managing Partner, Ron Schlecht discusses the latest details of Sabre's data breach. BTB Security's Managing Partner, Chris McGinley and NBC10's Brandon Hudson discuss data breaches and the need for protective measures. Wikileaks drops a bombshell and claims the CIA can turn your cell phones and personal home devices into eavesdropping tools. NBC10's Keith Jones visits BTB Security for answers and finds it safe to assume you're being monitored. Do you own an Amazon Echo? The device is involved in a murder investigation in Arkansas and the case is raising questions about privacy and technology. NBC10's Jacqueline London chats with security expert Ron Schlecht, Jr. to learn about the new technology. NBC10 talks to BTB about the Yahoo hack exposing 1 Billion users. This is one of the largest data breaches in US history. Hacker for a Day - Part 2 - BTB Security and NBC10 teamed up to demonstrate the realities of workplace cybercrime. BTB turned Matt DeLucia of NBC10 into a "hacker for a day." Hacker for a Day - Part 1 - BTB Security turned Matt DeLucia of NBC10 into a "hacker for a day." Did Via just compare us to Jason Bourne? Awesome! To celebrate security awareness month this October, we presented a free security awareness training session. This can be used by your company to brief employees on current security issues and train them on appropriate security actions. Turn the weakest link in to the strongest link! BTB Security's Chris McGinley appears on NBC10 News to address concerns raised by the latest release of hacked emails by WikiLeaks. 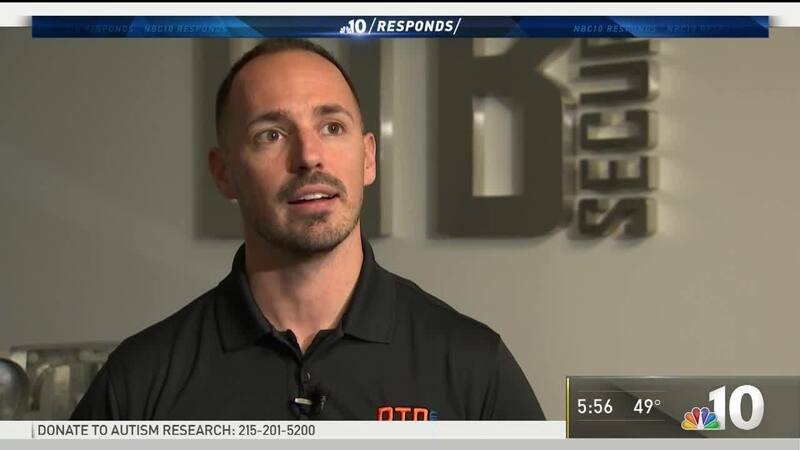 BTB Security's Chris McGinley was interviewed by NBC10 in Philadelphia about the recent news that Yahoo email was being scanned by government intelligence agencies. Attackers have been exploiting weaknesses in the LLMNR/NBNS protocols from Linux based machines for years. These methods typically required an attacker to be physically located on the victim's network, limiting the attack surface. With the growing popularity of Powershell among attackers, attackers have discovered ways to exploit these protocols directly from Windows machines. This greatly increases the risks to phishing victims as it provides yet another way to collect privileged credentials and pivot deeper into the network. Learn how these attacks are performed and prevented. MFA is getting adopted as one of the mainstream infosec controls. We believe you should have it. What happens if you don't (speaking from our experience and war stories) and what types of risks are you really addressing with MFA? You may be surprised by what most MFA doesn't protect you from (i.e., there's no silver bullet and MFA is definitely not it): HTTP authentication and phishing attacks. Top 10 Things You Can Do to Stay Out of the News! Presentation at the 2015 Delaware Cyber Security Workshop on September 29, 2015. Top 10 Things You Can Do to Stay Out of the News! Companies are being breached at an alarming rate. While some attacks have gotten more advanced, most are taking advantage of obscure default settings and simple misconfigurations to gain access to your network and escalate privileges. This talk will focus on the top security controls that can be implemented at low cost and low impact to your network, ensuring maximum ROI of your Domain Admins valuable time. Missing this talk could mean risking your companies reputation. With the upward trend in telecommuting, endpoint protection has become more and more important. BTB Security will show how easy it is to thwart signature-based Anti-Virus and what measures should be put in place to reduce the risk of exposure. The Advanced Persistent Threat (APT) is a terrifying concept as it means an attacker has gained unauthorized access to your environment and has been there long enough to be described as persistent. Unfortunately an APT can mean a lot of different things to a lot of different people. In truth, an APT can certainly be a number of different things, but regardless of delivery method and payload, APTs generally have the same characteristics. BTB is well versed in the art of the APT and has even developed their own unique tool used during Penetration Testing to demonstrate the risks associated with an APT. We'll spotlight a rather recent network intrusion case that was worked with the Secret Service. The case led to an international investigation, but really emphasizes that computer crime has changed, and that it’s more tightly woven into organized and street crime. This covers the various techniques BTB Security uses in pen tests to defeat the protections put in place, and break in to our clients. Developing your ROI for tools, processes, education for your team, for your user community and your board of directors. Webinar from 5/21/2015 - David Williams and Matt Barnett of BTB Security talked about a 10+ year-long issue that still remain unresolved in many environments. The talk highlighted several issues: disabled SMB signing, LLMNR/NBNS spoofing attack, how these two issues combined could lead an attacker to easily compromise the entire environment (sometimes less than 10 minutes). We will also talk about issues with vulnerability management and vulnerability scoring metrics of these issues: the exploitability and risk of (disabled) SMB signing and LLMNR/NBNS are not accurately represented in most places; and how this issue has led to this issue being unaddressed in most places. The security practitioners at BTB have been in the industry for over a decade apiece and have conducted countless penetration tests and vulnerability assessments. That's given us quite the arsenal of stories to tell. Stories that we think you might not only find entertaining in some cases, but informative as well. When we conduct Penetration Tests we fill the role of the bad guy and target our clients' information resources accordingly. These stories and demonstrations are designed to shed some insight into the bad guy's approach to security, what's important to them, and how you can better defend your organization against them.